F and I have had multiple conversations about how buying and cooking a whole chicken would probably save us money, in that a whole chicken is cheaper per-kilo than buying boneless breasts or assorted chicken pieces separately. We had put off buying a whole chicken until inspired by enjoying a delicious one from the market with C & A for Sunday lunch in Brussels last weekend. I was planning a shopping trip for Monday and decided to buy a whole chicken and learn to cook it. Thanks to the Kitchn’s tutorial, preparing and roasting the bird was really easy. And so tasty. I was a bit anxious about the cooking time and whether or not the meat would be cooked, but it seemed to be (knock on wood!). 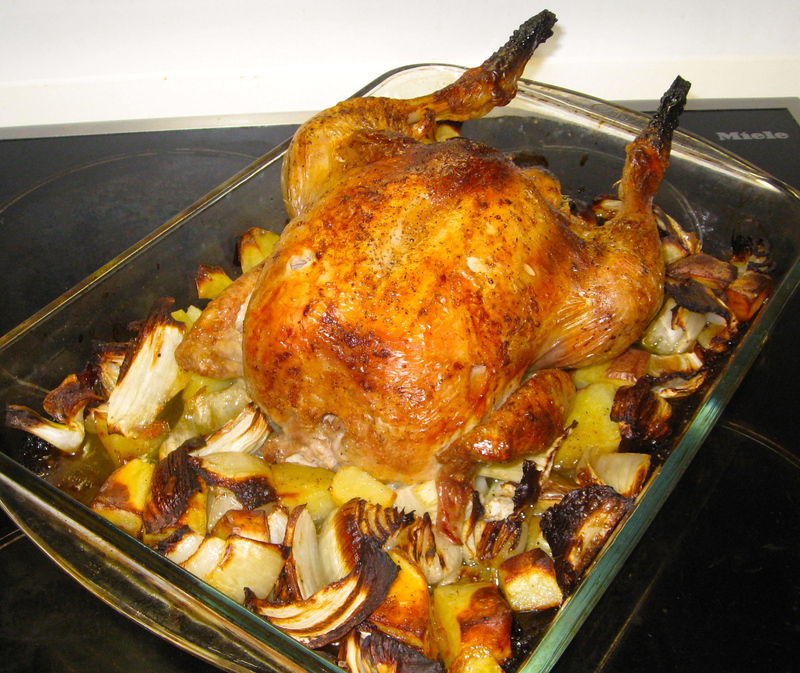 You can use any combination of vegetables underneath and around the chicken: I decided on onions, fennel, and potatoes. You can sneak some tasty things inside the chicken, too — I used two lemon halves (squeezed first over the veggies and chicken) and some garlic cloves. Feel free to get creative and use different veggies and seasonings. We’ll eat the leftover meat tomorrow and we’re already making chicken stock from the carcass, which will become soup at some point. Chop the onion, fennel, and potatoes and arrange in a baking pan. Drizzle with olive oil and season with salt and pepper. Unwrap the chicken and pat it dry, then rub it with olive oil and salt and pepper. Squeeze the lemon halves over the chicken and veggies, then pop the halves inside the chicken. Put the garlic cloves inside the chicken, too. Place the chicken on top of the veggies. Pop the pan in the oven and cook for 1-1.75 hours (depending on the size) or until the chicken thighs reach a temperature of 80-90C and the juices run clear. Baste regularly with the juices for crispy skin. Let the chicken rest for 10-15 minutes, then carve it up and enjoy! This entry was posted in food, full meals, health, pictures, recipes, travel on 09.04.2013 by taplatt.